A new restaurant opened up a while back that was different for this area. Several of our guests had asked if we knew anything about it but we didn’t. So off we went to see what the excitement was about. I must admit the Afghan Kabob Palace took me by surprise. The food they serve is very authentic Afghan – at least that is what people who have been to Afghanistan have told me. Not only that it is extremely good. The offerings range from vegetarian to lamb, beef and seafood. Try the Borani Badenjan (eggplant with tomato, garlic yogurt and mint served with naan), lamb tikka kabob or the chicken kofta kabob, and the sabzi chalow (spinach and lamb). Of course we also couldn’t leave without trying some of their firnee for dessert (custard with cardamom and rose water). The wait staff is very attentive and service time was just right between the courses. You can order ala carte (which we did) or a dinner combination. The ambiance makes you feel that you have entered a restaurant in Afghanistan – traditional, ceramic art works and appropriate soft background music. 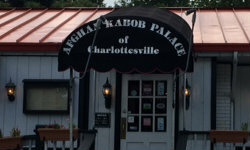 Afghan Kabob Palace has a terrific lunch buffet for only $8.95. You can sample many of their evening menu offerings at a very reasonable price.